The Ethiopian Government has expressed its unhappiness after an International Boundary Commission upheld its ruling that the symbolic village of Badme lies in Eritrea. The village was the starting point of the two and a half year war between the two countries in May 1998. 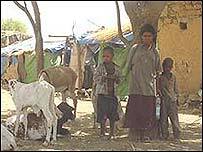 Eritrean troops entered the village, which was then administered by Ethiopia, claiming it as part of Eritrea. But the boundary commission - established to decide where the border lies between itself and Eritrea - has now upheld its ruling on the demarcation of the border. Ethiopian Prime Minister Meles Zenawi had already warned the United Nations that Ethiopia may reject the boundary commission's decision if certain adjustments were not made. Well now the government has expressed regret over the decision, but it still has not gone as far as openly rejecting it. The Ethiopian-Eritrean war formally ended with the signing of the Algiers peace agreement in December 2000. The agreement established the boundary commission to decide once and for all where the border lies, and both countries promised to abide by the decision. In a public statement, the government here said that the boundary commission did not stick to its mandate as defined in Algiers, and hopes that now it will rectify its mistakes. The diplomatic community is currently trying to find a way out of this impasse and is talking to the government to persuade it to accept the boundary ruling. But it is hard to see what will lead Addis Ababa into accepting that Badme is part of Eritrea. It would be a bitter pill for the government to swallow - and it says the people will not accept it. Ethiopia continues to hope that the boundary commission will reconsider its decision - the boundary commission says it can only do that if both Ethiopia and Eritrea agree that changes should be made. Though the boundary commission has made a purely legal decision, based on various treaties and historical reality, people here still link its decision with the war itself. The perception is that whichever country is awarded Badme will be seen as having been right when it came to the war.